ALGCIT DORM 1. 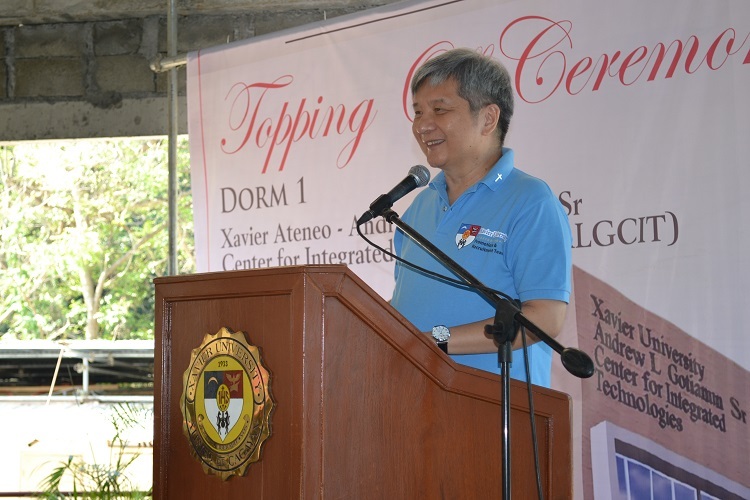 Xavier Ateneo holds the topping off ceremony for the first ALGCIT scholars' dormitory on Saturday, April 7. From left to right: TESDA OIC provincial director Gerry Quiblat, Xavier Ateneo VP for administration Edison Sasoy, Archt Apolonio Cruz of Aidea, SP Castro Inc director Pinky Castro-Roxas, Xavier Ateneo president Fr Roberto C Yap SJ, Filinvest Development Corporation Utilities Inc president and chief executive officer Juan Eugenio L Roxas, and Xavier Ateneo Board of Trustees chairman Francisco Guerra. 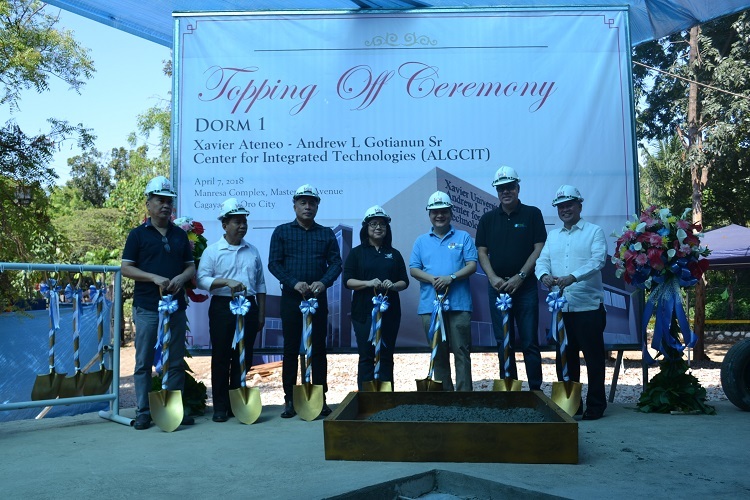 CAGAYAN DE ORO CITY, Philippines — Xavier Ateneo had a topping off ceremony for the university’s newest building that will serve as the residence of the inaugural 160 scholars of the Andrew L Gotianun Sr Center for Integrated Technologies (ALGCIT) Senior High School. 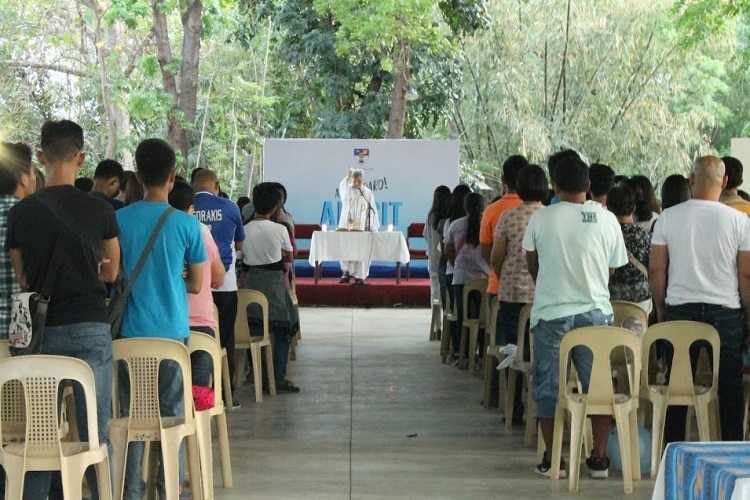 The event was held on Saturday morning, April 7 (on the birthday of St Francis Xavier, the university's patron saint), at the Manresa Farm Complex, where the dorm is located. In his message, Xavier Ateneo president Fr Roberto C Yap SJ expressed his gratitude to the Gotianun family for their generous donation of building a new school for the poor. Part of providing ALGCIT scholars with proper skill-training and quality education is the dormitory where they will be accommodated for the three-year program. The first two years will be allotted for academics and coursework, while the third year will be for their industry internship. Most of these scholars are students who are willing to learn but don’t have the means to as they come from financially-challenged families. The scholars are carefully selected and screened by the Admissions and Aid Office. XU's VP for basic education Dr Dulce Dawang also expressed her gratitude to the Gotianun family: "Allow us to thank again the generosity and benevolence of the Gotianuns who are funding this tremendous project we call the ALGCIT, with the aim of helping poor and deserving students get the quality education in a technical-vocational senior high school. This will eventually prepare them for life skills and help them provide for themselves with negosyo (business) and/or trabaho (employment)." 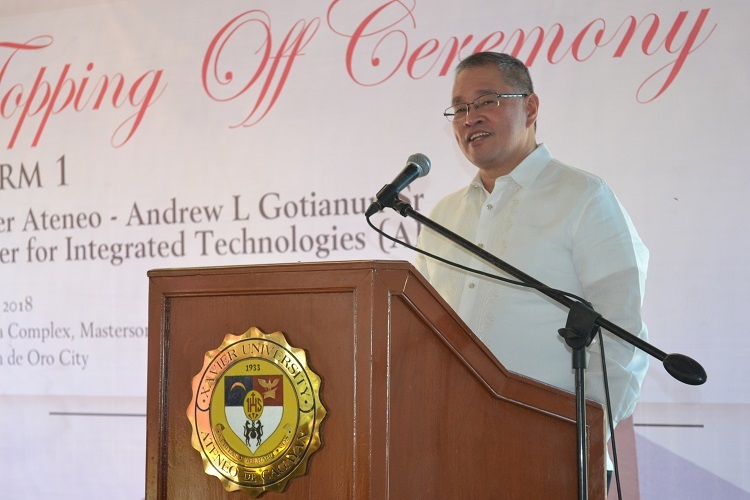 "This project has also challenged the university to rethink the concept of its SHS Tech-Voc track and catalyze its transformation to become a premier Tech-Voc Senior High School," Dawang added. XAVIER ATENEO LEADER. Xavier Ateneo president Fr Roberto C Yap SJ welcomes the guests at the ALGCIT Dorm 1 topping off ceremony on Saturday, April 7. 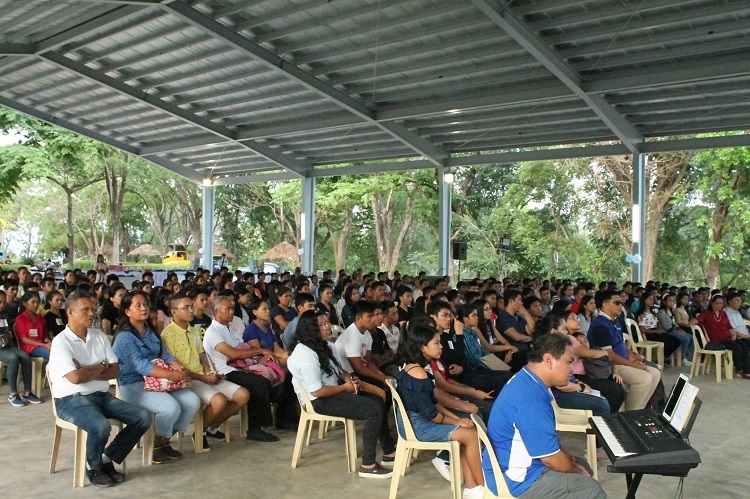 He shared that though running a technical-vocational school is uncommon among Jesuit academic institutions, this is a challenge and opportunity for Xavier Ateneo to help develop the tech-voc industry in the country, particularly in Mindanao, and to help accomplish the dream of the Gotianun family, who were also educated in Jesuit schools and universities. The first cohort of ALGCIT scholars will be composed of 160 students from various areas of Northern Mindanao and neighboring regions. 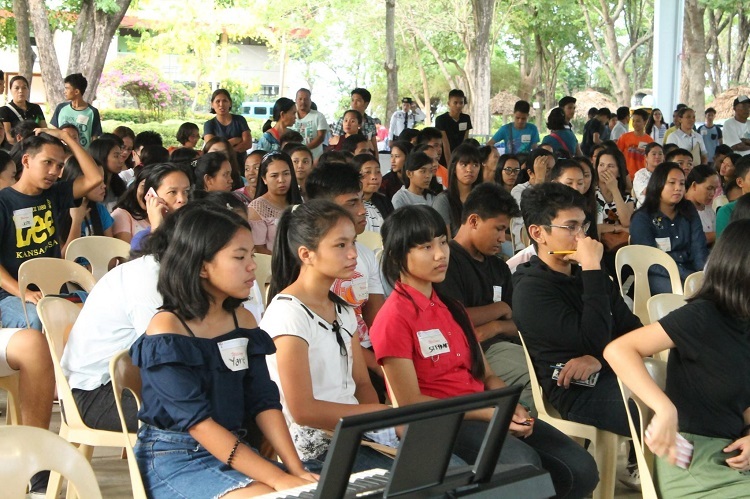 “We are excited to welcome our first batch of ALGCIT scholars next month as they will engage in a three-week summer enrichment program,” Xavier Ateneo SHS principal Dr Rogelio Gawahan said. On behalf of Filinvest Development Corporation chairman Jonathan T Gotianun and the Andrew Gotianun Sr Foundation, Juan Eugenio L Roxas, president and chief executive officer of FDC Utilities Inc (a Gotianun company), graced the topping off ceremony. Guests in attendance also included representatives from the public and private sectors. The first ALGCIT dorm is expected to be completed on May 31 in time for the opening of classes for AY2018-2019. The construction of two other dorms will follow. 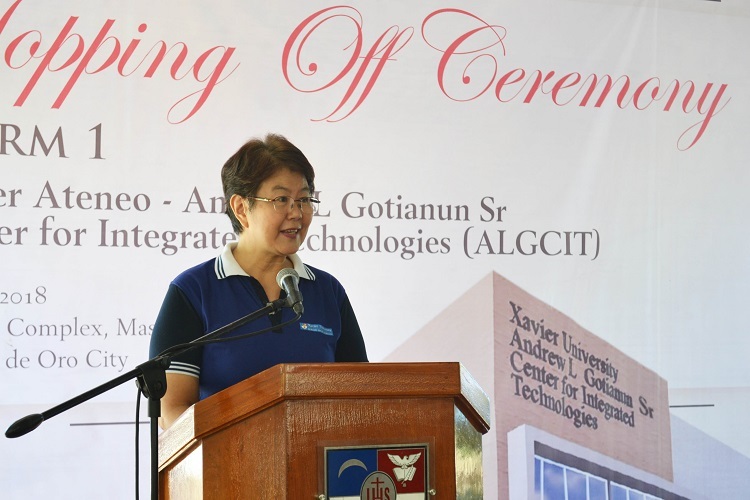 Xavier Ateneo's Advancement Office also launched at the same event the "ALGCIT Facilities Naming Rights Program" with the purpose of building long-term partnerships with different organizations and individuals. Under the naming rights program, the facilities (such as the dining hall, study rooms, dorm rooms, and laboratories, among others) will be named after the donors or a dedication of their own choosing. ALGCIT DORMS. Simulated aerial view of the three ALGCIT dorms, courtesy of Aidea Inc.
DORM LIFE. Xavier Ateneo Board of Trustees chairman Francisco "Frank" Guerra III recalls his college dorm life in his message during the topping off ceremony for the first ALGCIT dorm. He says: "[The dorm] is where you will learn what it's like to live with other people who are different for us, with different opinions, from different cultures, and of different backgrounds. The interaction is going to be tremendous. This is why it's such a meaningful occasion to start our journey with a dormitory." GENEROUS SCHOLARSHIP. In her message, Xavier Ateneo VP for basic education Dr Dulce Dawang thanks the Gotianun family for building the ALGCIT at Xavier Ateneo and for helping in the development of tech-voc education and industry through this generous scholarship. ALGCIT SCHOLARS. Xavier Ateneo Senior High School principal Dr Rogelio Gawahan says, “We are excited to welcome our first batch of ALGCIT scholars next month as they will engage in a three-week summer enrichment program." NAMING RIGHTS. 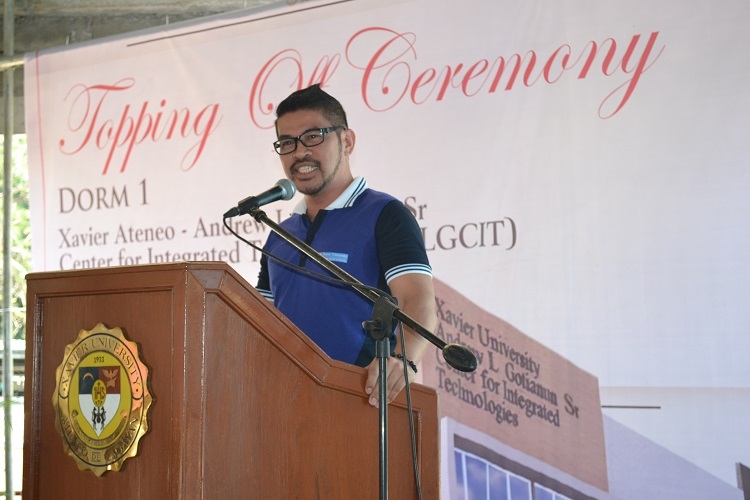 Xavier Ateneo Advancement Office director Rodelo Andrew Reyes leads the launching of the "ALGCIT Facilities Naming Rights Program" with the purpose of building long-term partnerships with different organizations and individuals. Under the naming rights program, the facilities (such as the dining hall, study rooms, dorm rooms, and laboratories, among others) will be named after the donors or a dedication of their own choosing. NEW XAVIER ATENEO SENIOR HIGH SCHOOL. The main building will house the classrooms, interfaith prayer rooms, laboratories, audio-visual rooms, student lounges, clinic, and administrative offices. Image supplied by Arch Ernest Martin Soriano. Xavier University - Ateneo de Cagayan is constructing a green campus for its senior high school in Pueblo, completing its basic education cluster in uptown Cagayan de Oro City. The new campus will implement environment-friendly technology in its buildings and operations. Among its salient features are the following: a sewerage treatment plant, rainwater collection system, natural ventilation, and sky gardens. They are designed to reduce the overall impact on the environment and human health. 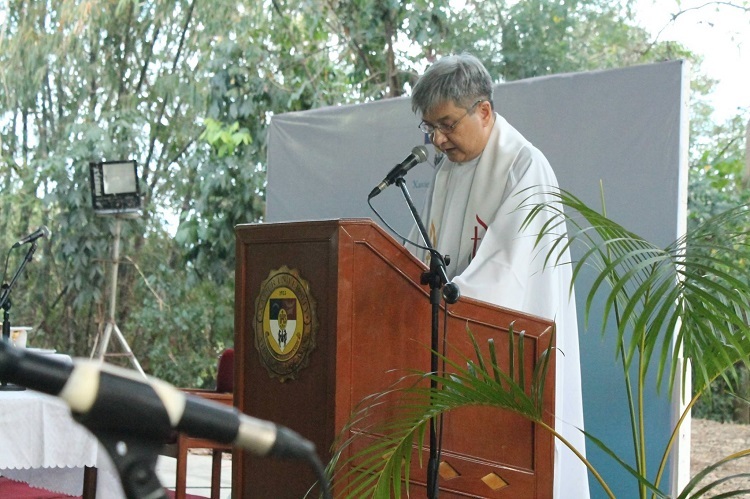 “Our mission is to make Xavier Ateneo Senior High School the ‘Senior High School of Choice’ in Mindanao and beyond,” university president Fr Roberto C Yap SJ said in his message during the groundbreaking ceremony held on Saturday, June 23. 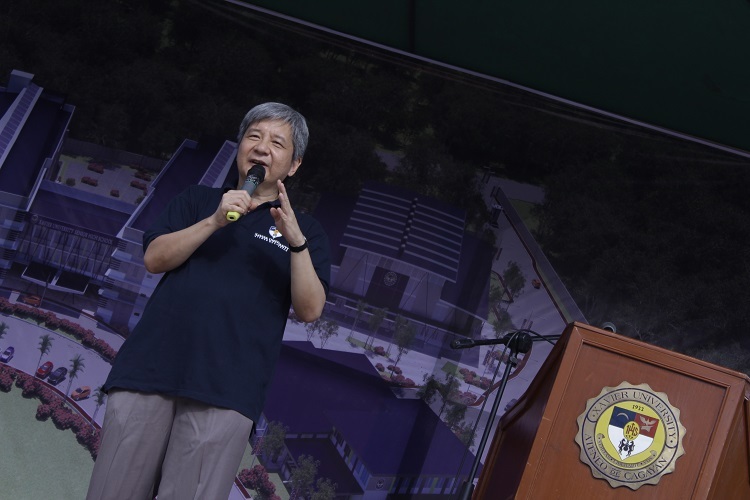 “Besides the quality of an Ignatian and Ateneo education in our senior high, we want to provide our students with a world-class campus, a new home for the Xavier Ateneo Senior High School community,” he added. SENIOR HIGH SCHOOL OF CHOICE. University president Fr Roberto C Yap SJ tells the crowd at the groundbreaking ceremony: “Our mission is to make Xavier Ateneo Senior High School the ‘Senior High School of Choice’ in Mindanao and beyond." Photo by Gene Gerard Verona. At the heart of the campus will be a chapel, to be built between the north and south wings of the main building. The structure connecting the two wings will house the school's faculty, administrative, and maintenance offices. To promote efficient energy use, the new classrooms and offices will be using T5 and led lighting and an inverter-type air conditioning system. Their cafeteria will boast indoor and outdoor dining areas for students and parents, faculty and staff, and guests. Architect Ernest Martin Soriano, the master designer of the new campus, made sure that air will flow freely within the buildings. He designed the sky gardens to provide insulation by absorbing the sunlight and reducing extreme temperatures. Water tanks will also be installed to store rainwater collected from the rooftops for the sprinkler system and industrial use. 'CAFET'. The new XUSHS cafeteria will boast indoor and outdoor dining areas for students and parents, faculty and staff, and guests. Image courtesy of Arch Soriano. Sports development is also emphasized in the dynamic student life at XU Senior High School with their own gymnasium (that could fit two basketball courts) and areas for practice and other activities. The newly-inaugurated Xavier Ateneo Sports Centre is also located nearby. XACS features a basketball court with 2 sub-courts for practices, retractable bleachers (2,000+ seats), four badminton courts, semi-Olympic-size swimming pool with shower area and locker rooms, track and field oval (8 lanes), regulation-size football field, and parking spaces for over 200 vehicles, among others. 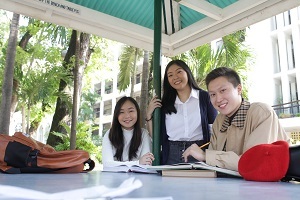 The main campus along Corrales Avenue in the city’s downtown has been hosting the senior high classes and activities since 2016 (the start of the rollout of the K-12 educational reform) up to the present academic year. Due to the K-12 program, the university had no college freshmen and sophomores in school years 2016-2017 and 2017-2018, hence, their classrooms were used instead for the senior high classes. Yap shared that the university board had planned a construction of an SHS campus in Pueblo de Oro at the start of the implementation of the SHS program in the Philippines. The plan is now being realized. “After three years of careful planning and waiting, we are finally moving the senior high school here [in the uptown],” Yap said. COMMUNITY. Guests from the business circles of Cagayan de Oro City, XUSHS faculty and staff, administrators, alumni, and student leaders (from XUSHS Central Student Government) take part in the groundbreaking of the new XUSHS campus. Photo by Verona. 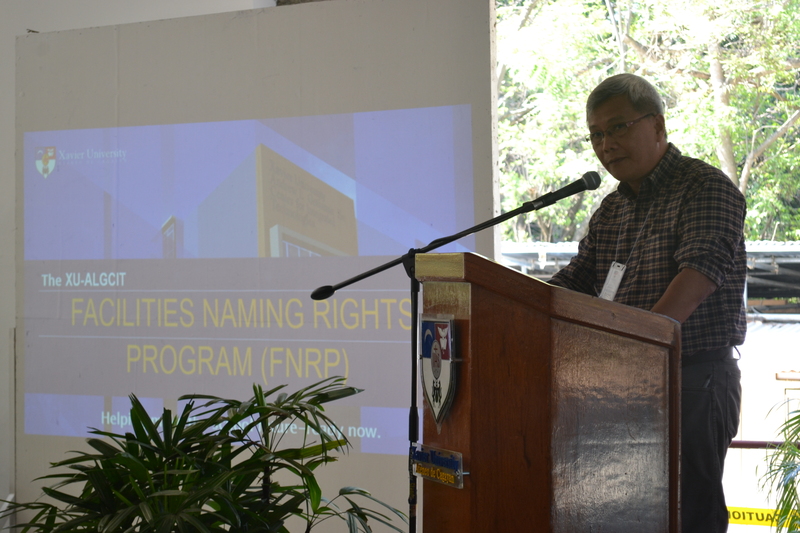 XU's advancement director Rodelo AB Reyes also launched the naming rights program for the new campus. He invited the guests to sponsor a classroom, laboratory, or a building which will then be named after their family name, business, patriarchs, or matriarchs. “In this program, ang pangalan niyo ay may forever,” Reyes quipped. “Even if an entire complex is taken by one donor, its components can still be [named after] other donors,” he said as he explained the process of the naming rights and mode of donation. 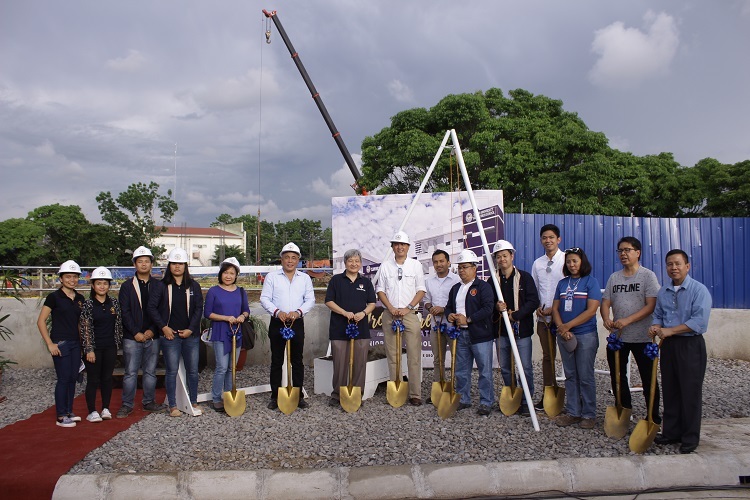 Guests from the business circles of CDO, XUSHS faculty and staff, administrators, alumni, and student leaders (from XUSHS Central Student Government) witnessed the groundbreaking, led by the Campus Development Office. The contractors, represented by Celso Dioko, and project managers, represented by Roger Antonio (SP Castro Inc) were also present at the event. In his closing remarks, VP for administration Edison Sasoy thanked everyone who attended and encouraged them to continue their support for the present and future endeavors of the university. XUSHS GYMNASIUM. Sports development is also emphasized in the dynamic student life at XU Senior High School with their own gymnasium (that could fit two basketball courts) and areas for practice and other activities. Image courtesy of Arch Soriano. ALGCIT WELCOME MASS. Xavier Ateneo welcomes its first batch of ALGCIT scholars with a mass presided by university president Fr Roberto C Yap SJ. Xavier University - Ateneo de Cagayan warmly embraced its inaugural batch of scholars of the Andrew L Gotianun Sr Center for Integrated Technologies (ALGCIT) Senior High School on the 1st of May, Feast of Saint Joseph the Worker. ALGCIT, an endowment from the Gotianun Foundation, provides full academic and residential scholarships to competent yet financially-disadvantaged youth. Tuition, matriculation, board & lodging, books, uniforms, and other school fees are all covered by this generous program. Xavier Ateneo’s ALGCIT aims to champion technical and vocational education, provide profitable employment options or entrepreneurial opportunities for its graduates, and contribute to the country's social and economic growth. PARENTS AND SCHOLARS. The parents accompany their children during the welcome program for the ALGCIT scholars, who came from various areas of Mindanao. ALGCIT is the university’s response to the need for a comprehensive program that helps students acquire skills, knowledge, and character formation necessary to develop their professional careers that are strongly grounded on Jesuit education, the Ateneo way. The program is a highly specialized three-year Tech-Voc Senior High School where the first two years are allotted for academics and coursework, while the third year is primarily for industry internship. In the face of globalization and the K-12 reform in our country’s educational system, ALGCIT puts its resources into honing the technical skills of the students in four globally in-demand specializations: (1) Automotive Servicing, (2) Computer and Electronics Technology, (3) Energy and Power System, and (4) Mechanical Design and Fabrication. At the end of the three-year program, the students are expected to graduate world-ready, with international and national standard competencies, and formed with magis (a philosophy of excellence) and cura personalis (care for the whole person). NEW SENIOR HIGH STUDENTS. XU Senior High School Central Student Government serves as the host of the welcome program for the ALGCIT scholars. Xavier Ateneo’s ALGCIT Senior High School is located inside XU's Manresa Complex along Fr William Masterson SJ Avenue, Upper Carmen, Cagayan de Oro City. 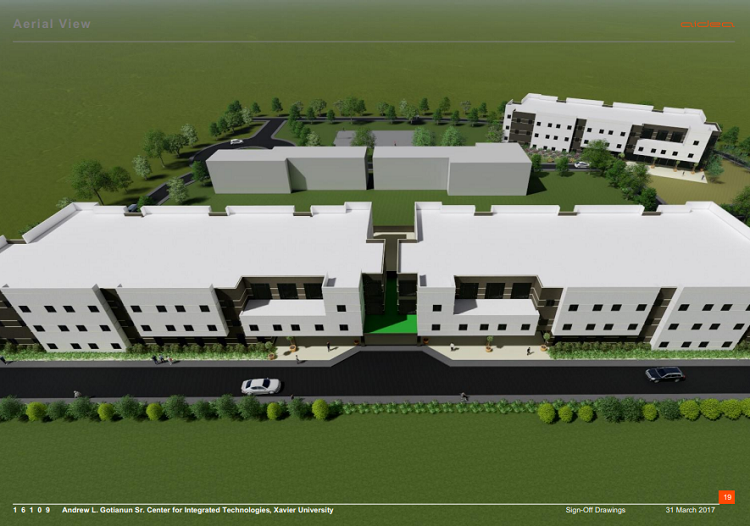 It is strategically located in an emerging area for foreign and local investors and sprawling subdivisions in the uptown portion of the city. The current XU Senior High School Central Student Government hosted the welcome program for the ALGCIT scholars, who had fun interacting with one another during the GTKY games. School administrators, faculty, staff, parents, and guests were also present in the said event. The ALGCIT scholars are temporarily housed in the three existing Manresa dormitories while waiting for the completion of the ALGCIT Dorm 1.